The event, a collaboration between the GCI and UCT, will run from 16 to 20 April. 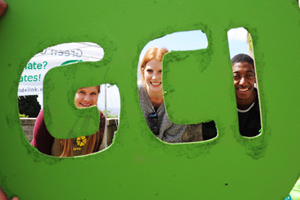 The GCI’s Keketso Motjuwadi explains that 2012’s Green Week theme was born of a desire to highlight a very serious subject – the deteriorating condition of our planet – in a light-hearted way. “If we keep going the way we are, then things could actually start changing to the point where one day the world could actually end because of environmental changes,” says Motjuwadi. In addition to the traditional ‘greening’ of the official UCT website, Green Week will include a ‘vegelicious’ bake sale and a talk on green economies hosted with the UCT Black Management Forum, among other events. This article was originally posted in our old website.